Public policy attempts to break the stranglehold of multigenerational poverty have largely failed. Partisan efforts to build personal, family, and community resources and a strong middle class haven’t worked either. One successful approach, based on the Bridges Out of Poverty methodology, focuses on bringing people from all classes, races, and sectors together to reduce poverty and build a sense of community. It’s a promise echoed in the findings of Alexis de Tocqueville, famed observer of American society. Successful change requires all voices and voters at the table to be heard and valued. 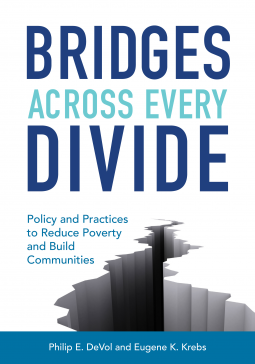 The Bridges Out of Poverty model is an antidote to current divisiveness, facilitates dialogue and respect among stakeholders, and offers policy-level direction for elected officials. The authors’ goal is to provide a road map for coming together as individuals, institutions, and communities to help people get out of poverty and create communities, states, and indeed a country where everyone can live well. The Bridges model offers a table at which all voices are valued, a common language to address the complex issues of poverty, and proven action steps. Seasoned public officials, decision makers, and even community members new to the world of policy making will find valuable advice in Bridges Across Every Divide.